The ECB has hinted on reducing deposit interest rates sparking a sell off of global bonds and a 14 basis point rise in the 15-year gilt yields suggesting annuity rates may improve. The 15-year gilt yields were higher by 14 basis points for the month as the European Central Bank (ECB) President Mario Draghi indicated a broadly positive experience with negative deposit interest rates. He also expressed a need to tackle low inflation and this started a global sell off of bonds sending yields higher. 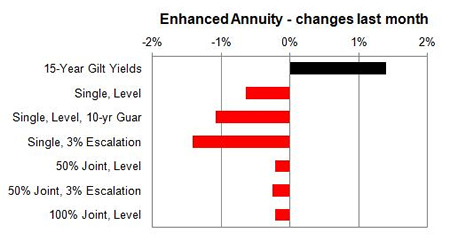 As a general rule a 14 basis point rise in yields would result in a 1.4% increase in annuity rates. Following the merger of enhanced annuity providers Just Retirement and Partnership Assurance to form the Just Retirement Partnership Group (JRP Group) rates have reduced across the board. Providers of enhanced and impaired annuities dominate the conventional annuity market by offering lifestyle rates and the recent change in their rates have impacted the whole market. Standard providers decreased rates by 1.53% and we would expect in the short term rates may rise by 2.93%. Smoker and enhanced annuity providers decreased their rates by 0.77% on average and in the short term rates may rise by 2.17%. 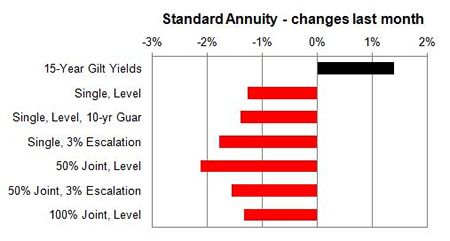 Standard annuities decreased by an average of 1.53% during the month with a larger decrease of up to 3.6%% for those aged 70-75 buying single life 3% escalating annuities. For enhanced and smoker providers rates the majority decreased by an average of 0.77% with a larger decrease of up to 4.20% for those aged 60-65 buying single life 3% escalating annuities. 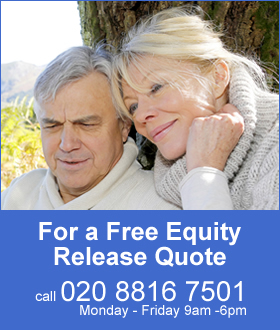 Only for those aged 75 on a single life basis received up to a 2.0% rise in rates.